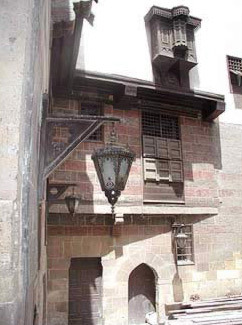 This House was built by Gamal El-Din El-Zahabi in 1637 A.D. / 1047 A.H. in Cairo. 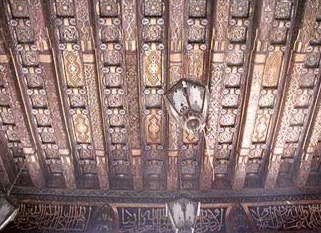 Gamal El-Din was the chief of the elite gold merchants during the 17th century as is inscribed inside the house on the frame of the loggia ceiling. 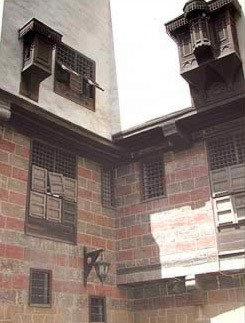 The House's street facade looking on to the narrow alley Harat Hoshqadam. In the same year, he constructed a "Wikala" (caravansary). It is located in the same area as the house though the remains are not impressive. The house is located in Harat Hoshqadam, a very popular area full of interesting Islamic monuments. Found at a near distance is Bab Zewiyla or Bab Al-Mitwali (1092/485), one of the three Fatimid Gates still standing. Also next to the house is Al-Fakahani Mosque, built by the Fatimid Caliph Al-Zahir in 1148. The structure seen nowadays dates back to 1735 when the Mosque was rebuilt by Ahmad Katkhuda al Kharbutli. Only the wood work remains a witness of the original building. Though the house was erected right after a century of Ottoman occupation, it shows no Turkish features. It is considered to be one of the fine examples of a Mameluke house, offering the typical luxurious characteristics usually found in a private residence. 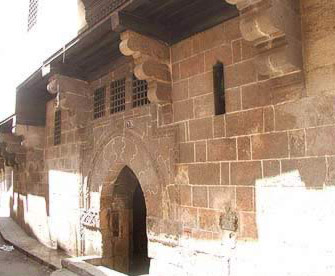 House of Gamal El-Din remains in its original condition. Due to it's unimpressive outside appearance, it does not attract much attention but once inside, one is surprised by the richness of its interior halls and chambers.